Humans keep hurting one another physically and verbally. Anger, greed, and jealousy fuel their flames of destruction. Yet through it all, love and compassion maneuvers though the smoke and ashes and picks up our spirit so we can see above the gloomy gray and into the light blue skies where our dreams and ideas flourish. Below is “Tenderness” by General Public. Like A Child, I Create Another Dream and Do It All Over Again. My sisters are princesses. My nieces are now princesses. They rule the world. Since I was young, I’ve wanted to save everyone from evil. I keep coming up with ideas and mix them with other ideas – some good and some bad. Then I pursue them until I live my imagination. But every now and then, my fantasy comes crashing down. Like a child, I create another dream and do it all over again. With my nieces Sophie and Elyse on the early morning of March 7, 2016, just before flying from San Francisco, California to Disney World in Orlando, Florida. My niece Elyse with Princess Belle of Beauty and the Beast at Disney World on March 8, 2016. My sister Mia, Elyse, and Sophie with Princess Anna of Frozen at Disney World on March 10, 2016. My niece Sophie in her Princess Snow White dress and younger sister Lara at the hotel in Disney World on March 10, 2016. My sister Lara holding my niece Sophie at Disney World on March 10, 2016. My niece Elyse and I in the dining hall of Princess Belle and the Beast at Disney World on March 11, 2016. A fun song fitting for this journal entry called “Crushin’ My Fairytale” by Celeste Buckingham. Every child is born into this realm with innocence. As we progress through life, we try to make sense of everything. Good people keep tying to do good, while those with anger, greed, jealousy, and the like, move around them like demons thirsting for power – all validating their actions, all thinking they’re right. In the end, death chases all of us down. By then, the children of tomorrow have become the next wave of love and hate. We’re all just part of this crazy cycle. So which side are you truly on? This song projects my frustration with the darkness of this world – “Breathe” by Eric Prydz ft. Rob Swire. “500 Days of Summer” is one of my all-time favorite movies. I like it because it’s so real, filled with all of life’s strengths and weaknesses. As much as we want our heart to act, sometimes it won’t, no matter how hard we try. On the opposite side, sometimes we fall in love, but the other person just can’t feel the same no matter how much that person cares for you. In the end, it hurts so much between the two of you. This movie is based on an experience that the screenwriter went through. The song “Sweet Disposition” by The Temper Trap really hits you in the right emotional spot and matches the movie. Multiple projects and issues are jumping around in my head. Multiple projects and issues are jumping around in my head while calls and messages keep coming in. So much so that I made an error the other day on one of my tasks. Studies have shown that multi-tasking reduces our performance. It’s much better to focus on one task at a time to maximize our output and results. With all the different projects and goals that I have to accomplish, I think my mind is going as fast as this song “Alone” by Marshmello. On Sunday July 24, 2016 at 2:00 p.m., I served as the MC for my Great Aunty May Fumiko Akimoto who is my mom’s baby sister’s mother-in-law. 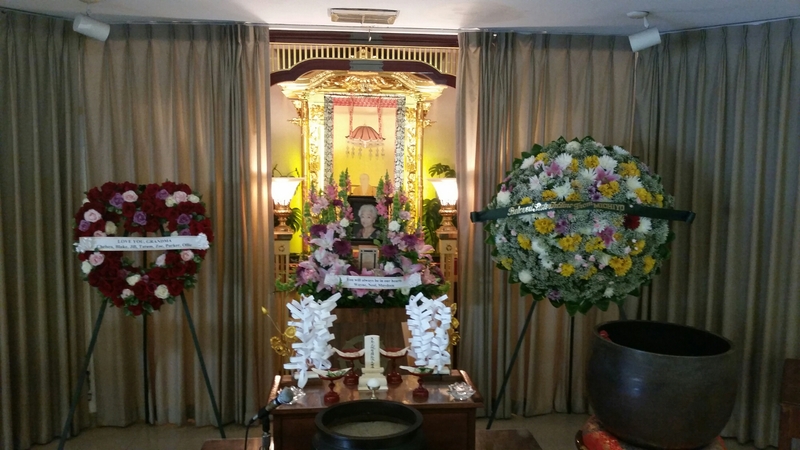 The service was held at Hosoi in Honolulu, Hawaii. My cousins Chelsea and Jill gave a nice remembrance speech, and it was touching to see the little ones, Tatum, Zoe, and Parker say their “Thank you” to the guests and “I love you” to their late great grandma, May Fumiko Akimoto. I will miss her. At Times, My Heart Floats Into A Realm of Nothingness. With the latest wave of passing of my family and friends, including my cousin Brad Tanaka, great aunt May Akimoto, and Congressman K. Mark Takai, at times, my heart floats into a realm of nothingness. While there, I gain clarity, and then return here to keep trying my best to live with all I’ve got. To all my friends, my heart is with you. There will never be anyone like you. Keep striving for your dreams. Most importantly, I wish you happiness. I dedicate this song “Surprise Yourself” by Jack Garratt & remixed by Griffin & Manila Killa.